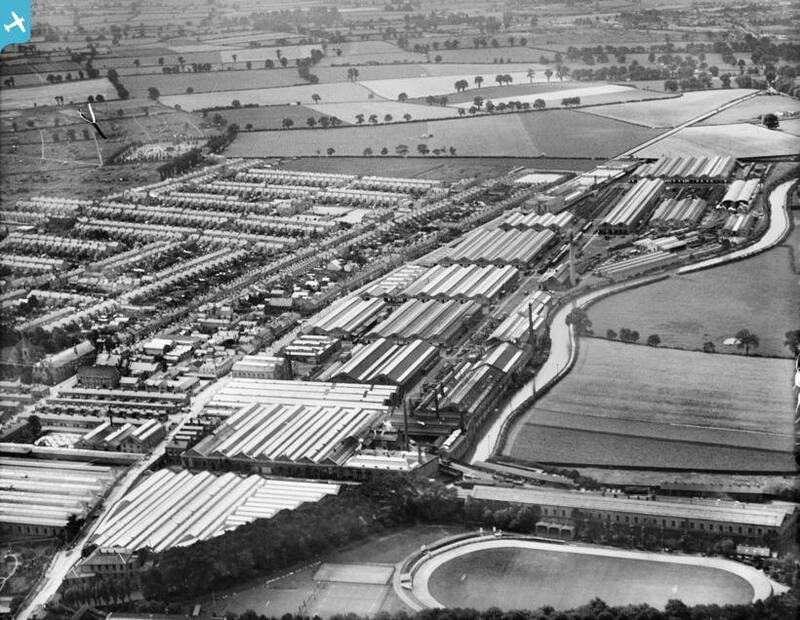 This photograph, taken in the 1930s, is a reminder that Wolverton was not a static development and that the development after Milton Keynes came into being just accelerated the pace of change. This is the Wolverton of my parents and grandparents. Victoria Street marked the southernmost limits of Wolverton and the residents on the west side of Anson Road had their gardens backing onto open fields. Stacey Avenue and Marina Drive and Gloucester Road are yet to come, as was the extension of Windsor Street. Eton Crescent and Aylesbury Street West were also developments that just preceded my birth. I can also remember Furze Way being built in the late 1940s, The cemetery appears quite isolated in the south west corner. The Carriage and Wagon Wworks and McCorquodales were probably at the peak of their development in this photo. The Poor Law Act of 1834 created Poor law Unions and also the Workhouse. Up to that time the responsibility for administering to the poor rested with the Parish. The Poor Law Act grouped parishes into unions so that this business could be administered centrally. The workhouse was createdbecause early Victorians believed that people should work for whatever charity they received from the state. It became a hated institution by those who experienced its tough regime at firsthand.For reasons which are entirely down to the Duke of Grafton’s influence the union for part of North Bucks and South Northants was established at Potterspury and the workhouse was built at Yardkey Gobion. The two advertisements here are from the Bucks Herald of September 8th 1838. Suppliers of bread, staple groceries, clothing and coal are invited to tender. 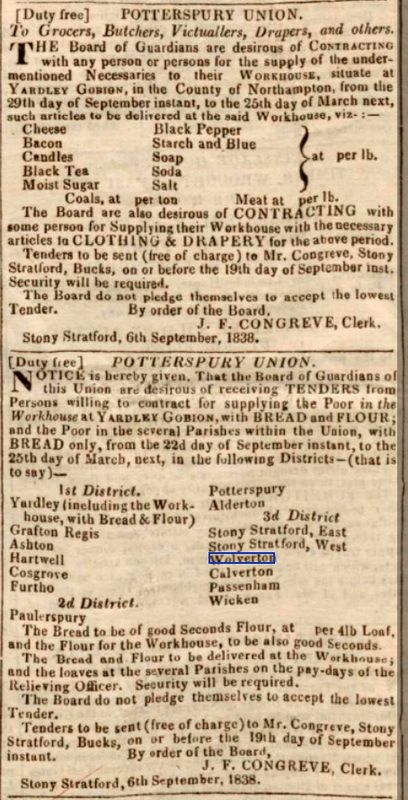 I don’t imagine the Workhouse overseers were looking for the best quality or for the highest prices. On Sunday night the mail train for London left Birmingham at its usual time, and proceeded with safety until near the station at Wolverton when a sudden outcry was raised that someone had been run over. The engineer immediately stopped the engine, and the guards ran back, when one of the stokers was found lying across the rails literally beheaded. It is supposed that the unfortunate man, while on the look out, must have slipped off the tender, and the wheels of the train passed over his neck. We regret to state that another dreadful and fatal accident occurred on the London and Birmingham Railway on Monday morning last. It has been endeavoured to keep the matter strictly secret, but from the enquiries our informant has instituted the following particulars have transpired: – It appears that on Sunday night the mail train for London left Birmingham at its usual time, and proceeded with safety till near the station at Wolverton, when a sudden outcry was raised that someone had been run over. The engineer stopped the engine, and the guards ran back, when a dreadful sight presented itself, one of the stokers being found lying across the rails literally beheaded. It is supposed that the unfortunate man must have slipped off the tender, and the wheels of the train passed over his neck. The body was removed to Wolverton, where it awaits a coroner’s inquest. The above is, we understand, the third accident on this railway within eight days, a man at the commencement of last week having his foot torn off by a train; and on Friday last, at the Wolverton station, Inspector Watts was crushed in a most dreadful manner, death terminating his sufferings almost immediately. An accident took place on the line of the London and Birmingham Railway, near Wolverton, on the morning of Saturday week, in consequence of which a man named White, an engineer in the employ of the Company, sustained injuries of an extensive and distressing nature. It appears that White had been entrusted to bring a train from Birmingham station to Wolverton, where he ought to have taken it on the opposite rail and there left it. On the contrary, however, he kept it on the same line upwards of two minutes after his arrival. Before he had quitted the up-train from Birmingham was observed approaching at full speed, leaving White no time to get out of the way. The consequence was, before ay check could be put on the speed of the up-train, it came into violent collision with that in which White was. The force of the concussion caused the engine to be detatched from the tender, which in its progress was turned off the rails and precipitated over the iron bridge into the canal that passes under it. White was discovered lying on the bank of the canal below the bridge, with one of his arms severed from his body, and his right thigh shockingly lacerated, besides having received several other severe contusions. Medical aid was procured, and amputation of the arm close to the shoulder was deemed indispensable. The train proceeded without any inconvenience save slight damage to one or two of the carriages by breaking the windows. The mail train from the north on Monday morning was thrown off the rails about a mile from Fenny Stratford, in consequence of running over two cows. The travelling post-office was much injured, and the horse box, in which the great portion of the mail bags are deposited, was nearly broken to pieces, as well as another carriage. An engine and a second class carriage were immediately sent for the conveyance of the mails to London, where they arrived two hours and forty minutes after the proper time. In consequence of the travelling office being broken, all the letters for the towns between Wolverton and London, and for the post towns on the line on each side the railway, were unavoidably brought on to London, from which place they were again dispatched by day mail to their destination. Fortunately the two clerks and the guard employed in the travelling post-office escaped without injury. Author Bryan DunleavyPosted on 4th May 2013 Categories Accidents, RailwayLeave a comment on More early Railway Accidents. Would you recognise this Wolverton? Yesterday I picked up a copy of Arthur Mee’s book on Buckinghamshire for £1. It was a volume in a monumental pre-war work which covered every county in its own volume and was called The King’s England. The format is an alphabetical arrangement of articles on each town and village. New Bradwell, by the way, was not included. This volume was first published in 1937. This is the Wolverton entry. Wolverton. We may wonder if we could not write half the story of our land round Wolverton, from the Saxon mound to the traffic lights at Oxford Circus. Certainly it has a very great story for this age of ours, and it comes out of the far past when the Saxons threw up the mound by the church. The church, with two fine cedars before it, throws its shadow over the mound and looks out into the meadows of the Ouse valley. There may have been a church here as old as the mound itself; we know there was a Norman church, for one of its carved stones is in the rectory, the patriarch of the village houses, with fluted Corinthian columns at the door and the arms of the Longuevilles on the pediment. The inner doorway of the rectory has grotesques in its spandrels and the head of a heraldic greyhound in its tympanum. But the Saxon church has gone completely, and all that is left of the Norman church is the queer head carved by a Norman mason and a consecration cross which was fixed in the wall when the church was made new last century. Of the mediaeval church the 14th century tower remains with its arches intact, and the grotesque Norman head is in its stair turret. There is a marble monument with one of our first baronets on it, Sir Thomas Longueville of 1685. But for the rest it is modern—a brass portrait of a vicar’s son killed in his teens while flying in France (Bouverie St Mildmay), a graceful font canopy with a golden eagle in flight as the pulley-weight, saints and angels on the reredos and Fathers of the Church on the pulpit, and a painting of Christ and the children above the tower arch. But we think of Wolverton not for what we see here but for what has happened here in days that seem to us so very long ago yet are still in living memory. The great works of the LMS have here transformed a village into a busy town. It is halfway from London to Birmingham, and it happened that it was a convenient place in the early days for teaching railways traffic control. Strange it seems to us today, but in the early days of trains there were men on the lines giving signals. It chanced that there were an unusual number of signal-posts near Wolverton station, and here men came for training. Here they were taught to stand erect for a signal if the line was clear, to wave a red flag before the engine if there was danger, and to bring the red flag smartly to the shoulder as the engine passed. They are scenes from Wolverton’s past which seem to give it a place of its own in the history of transport. London time 10.25; Local time 10.20. And so it is that Wolverton, beginning its story with the Saxon mound in the shadow of the trees, has not only something old and new for us to see, but something curious for us to know. It would appear that the writer spent a little time at Old Wolverton inspecting Holy Trinity and the Rectory and is able to give it a few paragraphs, but he must have taken one look at the town and concluded there was nothing interesting to say about it. He probably collared some likely-looking character on the Stratford Road who then gave him this entirely fanciful tale that the origin of the town depended on it being a training centre for signalmen. Author Bryan DunleavyPosted on 2nd May 2013 Categories Travel Guide, WolvertonLeave a comment on Would you recognise this Wolverton?